The 2 Big Secrets To Eliminate Garden Weeds - Forever! 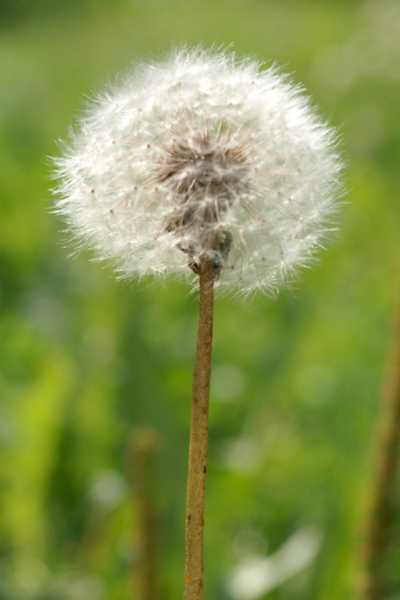 Want to eliminate garden weeds in your garden this year? And for years to come? As crazy as it may sound – stop working so hard! Believe it or not, many of the weeds gardeners deal with are the result of their own hard work. You can end the chores of weeding the garden by working less! And simply by working a bit less, weeding chores will nearly disappear. Weed seeds need to be “planted”. Just like bean, corn and tomato seeds do. Although gardeners intentionally plant vegetable seeds, weed seeds come at will. The seeds of weeds constantly find their way into the garden surface. The dreaded dandelion seed head. And how do those seeds on the surface get planted? Most of the time, by the gardener! Every time the soil is disturbed by tilling, shoveling or hoeing, the next crop of weed seeds is planted. A gardener hoes or tills to get rid of the weed seeds that have sprouted. And in doing so, the next round of weed seeds are planted. So with that said, it’s time to stop working so hard! Here is a closer look at the two big keys to eliminate garden weeds. The 2 Big Secrets To Eliminate Garden Weeds Forever! The rototiller is the most prolific planter of weeds in the history of gardening. 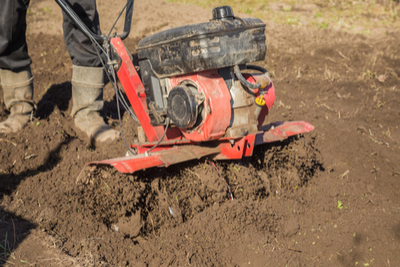 It might be a terrific tool for ripping up sod and preparing soil for a new garden. But beyond that, rototillers actually create a tremendous amount of work and problems in an established garden. Tilling can destroy important soil structure. And plant thousands of weed seeds. Not only are they expensive to buy, maintain and use, they are weed planting machines. Throughout late fall and winter, weed seeds find their way onto the surface of the garden. They lay there dormant, simply waiting for a chance to find their way into the soil. And in the spring, here comes the rototiller to help. Rototillers plant huge amounts of weed seeds as their tines rip through the soil. And the weed cycle begins. 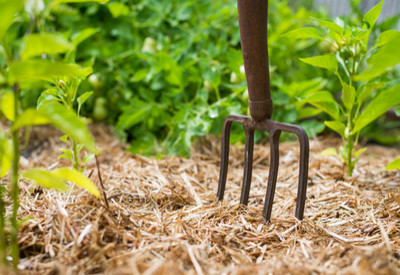 Once that cycle starts, most of a gardener’s work is spent keeping those sprouting weeds out of the freshly tilled rows and from around plants. 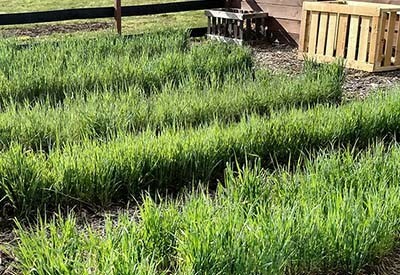 No-till garden cover crops play a major factor in eliminating weeds from the garden! The tiller is used again every few days to till under the weeds in the rows. And a hoe is then used to work weeds between the plants. All of which simply re-plant more weeds seeds. It all creates a tremendous amount of work for the gardener. All of that tilling and hoeing causes additional issues with the soil structure in a garden too. The heavy foot traffic and wheels rolling behind a tiller compacts the soil. And nothing can stunt a vegetable plant’s growth like having it’s roots compacted. 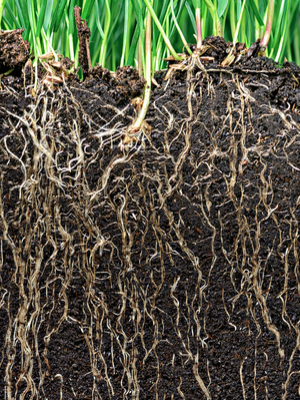 Good soil structure allows roots to grow freely. 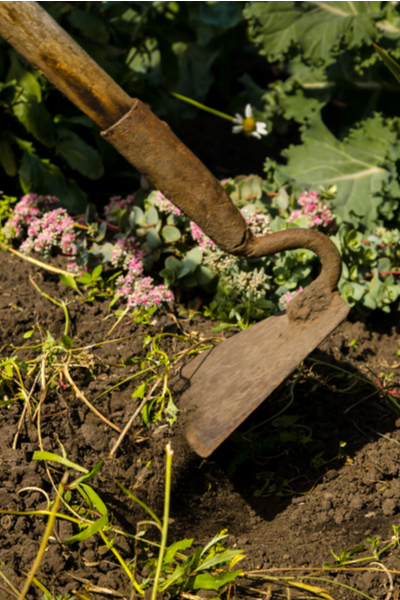 So rule number one – stop working that soil so much! #2 Cover Your Soil – Always! So how do you stop working the soil so much? By covering it. It really is that simple. When soil is covered, very few seeds ever find their way to germination. 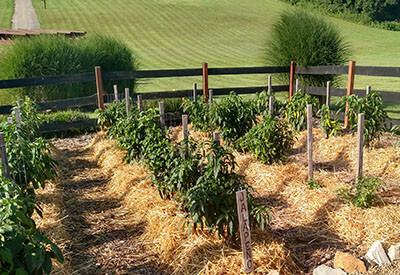 During the growing season, start by covering all of your walking rows with mulch. This way, you simply never ever have to maintain them. For us, we use a heavy 6″ thick coating of bark chips. But you can use straw, grass clippings, shredded leaves, or even newspaper or cardboard. Next, mulch around plants to keep the weed seeds out. We use a heavy 2 to 3″ mulching of compost and straw around our plants and in our growing rows. It keeps out weeds, and the compost provides added nutrients to the plants. You can also use straw, shredded leaves or even grass clippings in this area as well. But whatever you do, cover bare soil in the garden! When you do, it is amazing to how quickly it will simply help you eliminate garden weeds. Leaving garden soil bare over the winter is an open invitation to create next year’s weeds. Our annual rye cover crop growing in the garden in the fall. And cover crops also put nutrients back into the soil. Nutrients that the vegetable crop took out while growing. So put away the tiller, put down a little mulch and grab your favorite beverage. And sit down and watch the weeds not grow this year! Happy Gardening! Jim & Mary. If you would like to receive our DIY, Gardening and Recipe articles each week, you can sign up to follow the blog via email in the right hand column above, “Like” us on Facebook, or follow us on Twitter. This article may contain affiliate links. No, we actually leave it in place all winter, then mow it off in the early spring. It usually takes about 3 mowings and it dies off. We then plant right through the cover crop without ever having to till. It is a very easy and quick process. You use a rototiller to turn the rye crop in. Am I right? I planted Austrian peas last winter 2017/2018. Then that spring I cut the tops off and fed them to the chickens. The roots stayed in the ground helping to aerate the ground and add nitrogen (if my memory doesn’t fail me). I was wondering the same thing. Does it just wilt away? We have been blessed by a local tree service dumping their chips on our property. We are entering our third year and have accumulated over 200 loads, about 800 tons, on 7 acres. The condition of the soil has improved tremendously. We still have a few problems with weeds and grasses but only in areas where feral hogs come in at night and root around in the chips. We can’t say enough about how chips have improved our yields and lowered our work load. In addition, last July and August, during the hottest times of the year here in South Texas we only watered twice each month. That is a huge savings in our most precious of natural resources, water. Thanks for the article and Christ bless. PS: Keep in mind that chips need a couple years of decomposition to really improve the soil. But the benefits of weed control, reduced water needs, and much reduced labor are immediate. This will be our second Spring of raised row gardening, and the results the first year were spectacular! In our area we’ve become leery of straw for mulch, since we’re not sure of a source that was not treated with broad-leaf herbicides. I’ve switched to pine chip bedding in the chicken coops, which will find its way into the garden eventually. I found a good source of pine straw on the property to use for mulch everywhere but the planting rows, and hauled in several trailer loads last Fall. Also planted Winter Rye last fall for cover crop. Can’t wait to see the results this year. At 71 y.o. it’s extremely important to me that this method is something I can do. My sister/garden partner is a few years younger but she appreciates the approach as well. Regarding cover crop I agree it is great. I have raised beds made out of hemlock. 16 feet long 2 feet wide. I plant cove crop in these beds what do I do with it in the spring? Do you keep a pile of wood chips lying around to add mulch to pathways when needed? Do you just move it by wheelbarrow full? I’ve been trying to keep my paths and growing beds mulched and it’s a big job every spring to haul more wood chip mulch to pathways, granted I do have a large garden. Any tips?